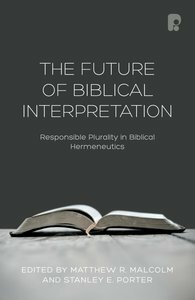 About "The Future of Biblical Interpretation: Responsible Plurality in Biblical Hermeneutics"
Matthew R. Malcolm is Lecturer in New Testament at Trinity Theological College, Western Australia. He is the author of The World of 1 Corinthians (2012), and co-editor, with Stanley E. Porter, of The Future of Biblical Interpretation: Responsible Plurality in Biblical Hermeneutics (forthcoming), and Horizons in Hermeneutics: A Festschrift in Honor of Anthony C. Thiselton (forthcoming). Stanley E. Porter (Ph.D., University of Sheffield) is president, dean, and professor of New Testament at McMaster Divinity College, Hamilton, Ontario. He is the author of many books on the New Testament and the editor of more than forty other volumes, including Reading the Gospels Today. Some of his significant works include Idioms of the Greek New Testament; Paul in Acts; Fundamentals of New Testament Greek; The Criteria for Authenticity in Historical-Jesus Research; The Book of Acts (New International Greek Testament Commentary); The Pastoral Epistles (Baker Exegetical Commentary on the New Testament); Verbal Aspect in the Greek of the New Testament, with Reference to Tense & Mood (Studies in Biblical Greek ; Vol 1) and Romans (Readings: A New Biblical Commentary).